What is I Don´t Replace a Missing Tooth? Teeth work together. When you lose a tooth, the nearby teeth may tilt or drift into the empty space. The teeth in the opposite jaw may also shift up or down toward the space. This can affect your bite and place unusual stress on your teeth and jaw joints. Teeth that have tipped or drifted are often hard to clean, as well. This makes them more at risk for tooth decay and gum disease. When a tooth is missing, the bone around it may shrink. This can change the way the jawbone supports the lips and cheeks. Over time, this can cause the face to sag and can make you look older. 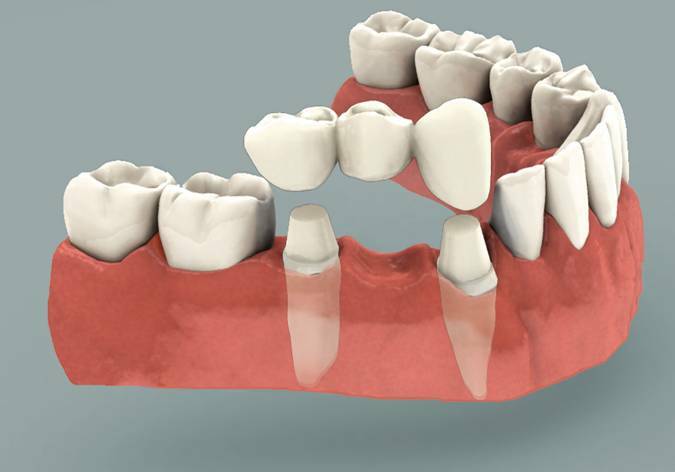 Placing a bridge usually requires more than one dental visit. On your first visit, your dentist prepares the teeth on either side of the gap. The bridge will later be attached to these teeth. Your dentist then takes an impression of your teeth and the space and sends the impression to a dental laboratory. Technicians at the lab make the bridge. Your dentist will place a temporary bridge while you are waiting for the permanent one. A bridge has three parts, a pontic in the middle and a crown on either side. The crowns fit over the prepared teeth next to the gap. The pontic fills the space left bye the missing tooth. 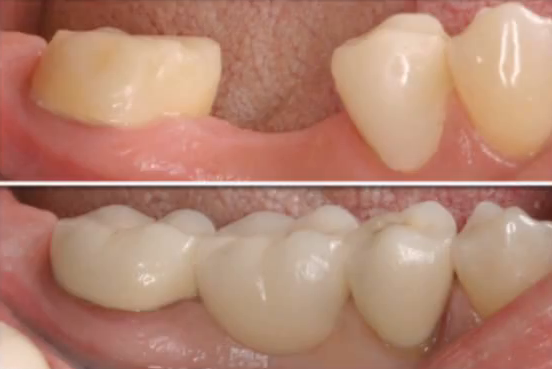 The bridge is then fixed, or cemented to the prepared teeth. The bridge is permanent and cannot be taken out of your mouth without a dentist´s help. At the follow-up visit to the dentist, the bridge is fitted, adjusted and cemented in place. 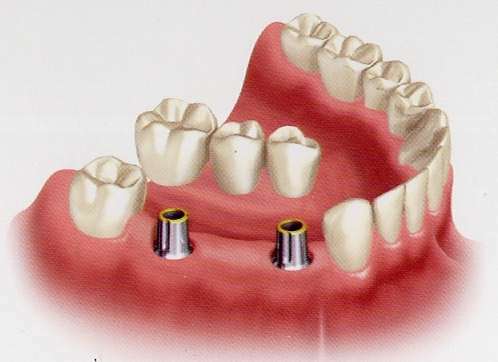 Some patients choose to have dental implant placed to support a bridge. Dental implant are posts that are surgically placed blow the gums. An implant works the same way as a natural tooth. The implants fuse to the jawbone to act as a base for the bridge. Dental implants are more common when a patient has several missing teeth. Because surgery is required, candidates for dental implants should have good general health and enough bone to support an implant. For some patients, implants help preserve the bone where teeth has been lost. Bridges are made from metal, ceramics, or a combination. Ceramics often are bonded to a metal alloy. The dentist thinks about the appearance and functions of the bridge and can talk about the materials that are best for you. Brush three times a day and floss or use an interdental cleaner. Interdental cleaners are specially shaped brushes or rubber, plastic or wooden devices. Brushing and cleaning between the teeth helps remove plaque, a sticky film of bacteria. Clean between your teeth and under the bridge. A helpful tool besides floss is a water jet. However, a water jet is not to be used instead of flossing. See your dentist regularly for check-ups and professional cleanings. Eat a balanced diet for good health. Look for oral care products that have the ADA Seal of Acceptance. Products that display the Seal have met the American Dental Association´s Council on Scientific Affairs criteria for safety and effectiveness.